Sponsored by the Center for Theory of Change. All webinars conducted by ActKnowledge staff members. sign up for updates and webinar notices. Join the evaluation experts from ActKnowledge as they introduce you to Theory of Change, an innovative and participatory method of planning and evaluation that allows you to explain and understand how change happens and why an initiative is expected to work. This recorded webinar will introduce you and your organization to the concepts and basic methodology of ToC. Viewers will come away with an understanding of the strengths of ToC as a tool for planning, strategy, organizational learning and evaluation. 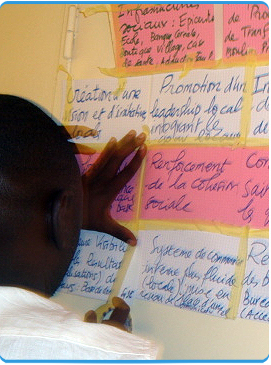 Recommended for anyone interested in ToC who want to build and modify a dynamic Theory of Change via an accessible, easy-to-use learning tool for creating and implementing a Theory of Change – Theory of Change Online (TOCO). 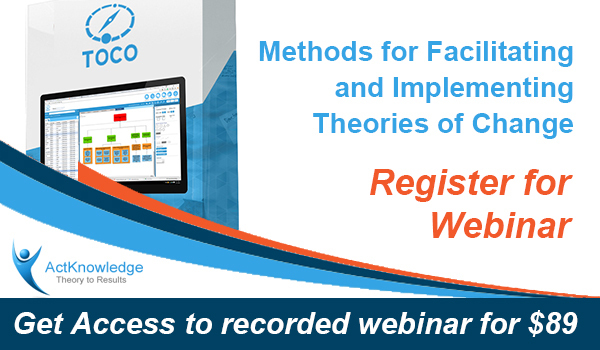 This webinar is appropriate for beginners through advanced and provides useful insight for effective use of the powerful tools contained in the Theory of Change online application (TOCO). Recommended for Community School practitioners, leaders, lead agencies and partners to understand how a ToC can form a foundation for planning, partnership agreements and evaluation. This webinar covers the basics of what a ToC is: components, examples of how it has been used in community school settings, best practices, challenges and what is needed to begin and best use a Community School Theory. Many initiatives come to realize that their long term outcomes are dependent on the buy–in and interventions of others. All the planning in the world cannot make an initiative succeed if that planning does not clearly visualize and plan for the incorporation of all the necessary players and stakeholders. This webinar will demonstrate how to spot key players and consider the landscape of competitors and allies. We will discuss synergies of interventions, strategic planning of those resources, scalability through partnering, and various methods on how to conduct a collective impact analysis with your planning and evaluation efforts. Please note there is a limited attendee capacity for this Webinar. Attendees should have completed the Theory of Change Fundamentals Webinar previously. Recommended for initiatives that have begun a ToC process or have a ToC, but are not sure of next steps; how to ensure high quality; how to use their ToC to move forward. In the Intermediate Level, we look at some completed Community School theories and how they were created – the logistics and facilitation, as well as how they have been used for developing workplans, performance monitoring and evaluation. This webinar will also help you become educated consumers to know what criteria will help you find a good facilitator or evaluator for your initiative. Recommended for those that know what a ToC is and its benefits, but need concrete advice and tools on how to manage organizational use of the ToC, create planning and evaluation systems based on ToC. We also cover the differences between ToCs and other methods, such as logic models and logframes. Case studies of other initiatives using a Theory of Change approach in an advanced way will be included.